A Boy Scout who packed a toy grenade in his carry-on bag caused the shutdown of a security checkpoint at Houston’s William P. Hobby Airport. It’s not clear why the 17-year-old had the item in his bag. 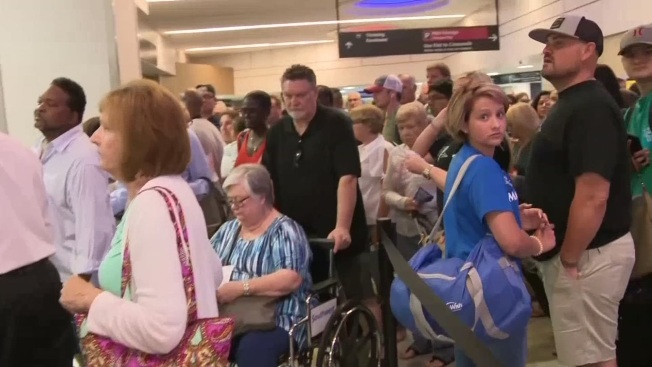 A Boy Scout who packed a toy grenade in his carry-on bag caused the shutdown of a security checkpoint at Houston’s William P. Hobby Airport Thursday morning, just a day after the international terminal of the city’s other major airport was evacuated due to a bomb scare. “My wife and I were waiting to drop our bags into the X-ray machine and go through the detector, and I heard a TSA agent scream ‘Shut it down, shut it down, shut it down!’ Everyone was looking around, confused, and people were ordered to ’Clear out now!’” the AP’s John L. Mone said. Julie Morrow Abram, a passenger at the airport, told NBC News, "it was terribly frightening."